The next meeting of the Society takes place on Thursday 8th January 2009 at 7:30 pm in St. Andrew’s Church, Bilston Street, Sedgley. Members and visitors are invited to come along and share their memories of industries and places of work in Sedgley, Coseley and the Gornals. Everyone is invited to bring along artefacts, photographs, brochures and memorabilia or just tell stories of life in the work place. Start the New Year by sharing your memories and ‘treasures’ at this friendly gathering. It’s an ideal evening to banish those winter blues and reminisce about a world of work that has all but disappeared. As usual visitors are invited to come along - cost £1. Poignant memorials can be found throughout the Manor. What is the significance and location of this one? The war memorial is set into the front of Lower Gornal parish hall, better known as the Memorial Hall [foundation stone laid in 1924]. 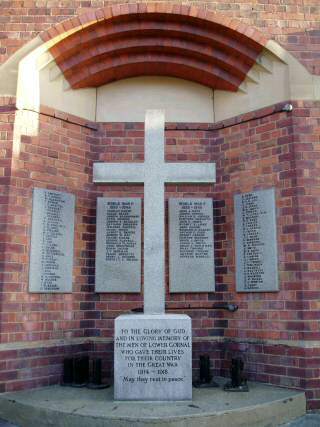 The side panels record names from the First World War and the rear panels from the Second World War. November 11th 2008 was the 90th Anniversary of the end of the Great War. Even on the last day over 800 Commonwealth soldiers died bringing the total to almost 659,000, a horrendous sacrifice.